This page is a step by step guide to one of our two online shops: the Craftsman Laboratory. As you already know, the Craftsman Laboratory is different from our Gleni Boutique, as it gives you the opportunity of choosing the style of handbag you like the best and then personalizing it with your choice of color and leather, from the selection currently available. Here we’d like to explain in as much detail as possible how to navigate within our Craftsman Laboratory, to select the leather and color for your custom-made handbag, so that even those who are not familiar with our two online shops can make their selection comfortably and easily. On the handbag’s product sheet (as you can see in the example of the python handbag product sheet) to the right of the image, underneath the description of the handbag, you will find a box with drop down menus where you can choose both the type of leather and the color that you would like your made to order handbag crafted in. There is a box for each of the two criteria that you need to select – one for the leather and one for the color. This first box, immediately under the handbag description, is the quickest option for those who already know what colors are available, or have already decided what color and leather they would like their handbag made in. 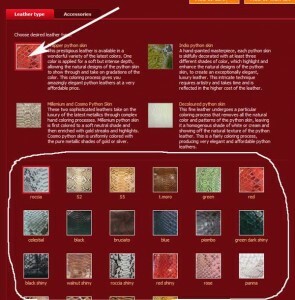 From the drop down menu, all you have to do is select the type of leather (for example the variety of python skin you want), after which in the second field all the colors available for this type of leather will appear. Each type of leather has its own range of available colors, so that if you choose Trapper Python skin, for example, you will find a different list of colors than if you had chosen Indio python skin. Once you have made your selection, the price shown on the handbag product sheet may adjust to take into account the leather you have just chosen, as the price of the handbag varies according to the leather it is made from. * Please note: the price initially indicated on each product sheet is the price for the handbag to be made in the type of leather already showing as the default in the box (for python handbags the default setting is Trapper python leather) and doesn’t necessarily correspond to the leather-type of the handbag shown in the accompanying image. 2. The other more visual and intuitive way to choose the color that you’d like for your custom-made handbag, is to go to the second box further down the page, containing a graphic image of all the available colors. You should first select the leather variety you are interested in (by clicking on the image, beside which you will find a short but quite detailed description of the type of leather in question). According to your choice of leather type, the available colors for that leather will appear below in the second part of the graphic box. In this way you can look at all the different types of leather and available colors, selecting each type of leather in turn until you find the one with the colors you like best. 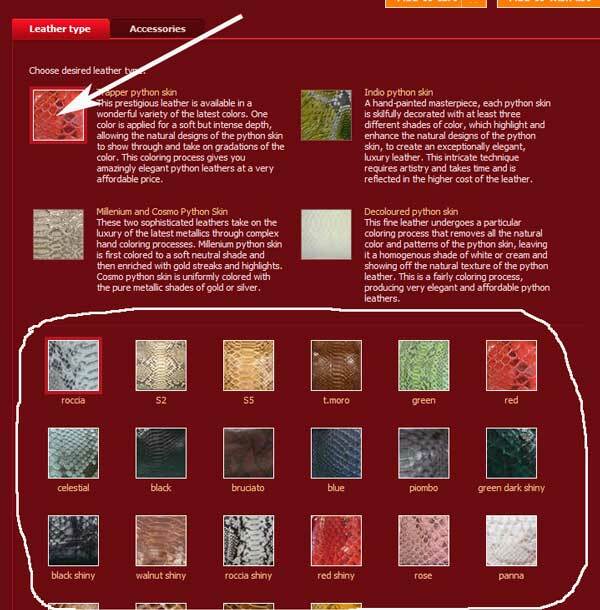 You can see that the type of leather that is currently selected is indicated by the red border around its image box and the color selected within the leahter category is also shown by an identical red border – in this example the color Roccia is selected. All you have to do to change the color selected, is click on the image of the color you like best. When you click you will see that the information in the first box, (immediately underneath the product description, described above) will also change as both the color selection modes are linked. The appropriate price for the leather you have selected will appear next to the product description. This second graphic box is definitely the simplest way to get an idea of the colors available and to choose the right shade for your handbag to be made in. Now all you need to do is add the handbag that you have selected into your shopping cart, by clicking on the ‘Add to cart’ button, either below the first box, or after the table of colors at the bottom of the page. In your order you will be able to check the leather type and color which will be listed next to the handbag details.